A fun footvolley session turned out to be injurious for Diego Schwartzman as the Argentine suffered a minor scratch on his face after being inadvertently kicked by fellow tennis player Dominic Thiem. Thiem and Schwartzman attended a Boca Juniors game on Sunday, where they showed off their footvolley skills during the half-time break. However, in a video that surfaced on social media, the duo collided in an attempt to return a ball. Meanwhile, both Thiem and Schwartzman are currently in Buenos Aires for the 2018 Argentina Open that begins on Monday. Austria’s Thiem has been given the top billing, and has a bye in the first round of the 32-player draw. Schwartzman, on the other hand, has been seeded fifth, with Austria’s Andreas Haider-Maurer being his opponent first up. 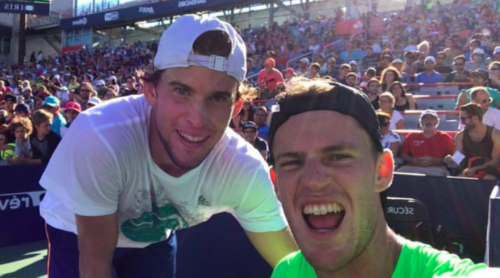 Interestingly, Thiem and Schwartzman will join forces in the doubles event. They will take on the Czech team of Roman Jebavy and Jiri Vesely in the opening round.